German forward Julian Draxler does not intend to leave Paris St Germain. The 23-year-old feels ready to take up the challenge after the French football club signed Brazilian superstar Neymar for 222 million euro ($264 million) from Spanish giant FC Barcelona and French sensation Kylian Mpappe on a loan deal from AS Monaco. The former VfL Wolfsburg striker is aware of the new quality in his club. “It is going to be a hard competition. We have gained exceptional quality. But every top side in Europe counts on a squad full of top class players,” Draxler said. Draxler mentioned that he took up club training later than club mates due to the 2017 Confederations Cup. The club’s goals address his goals as PSG want to be successful in the 2017/2018 Champions League campaign. Draxler said he feels extremely well in Paris and never considered to leave. That won’t change he said. The 23-year-old spoke about a meeting with PSG coach Unai Emery, who told him he counts on him in the future and that he was very much satisfied with Draxler’s performance last season. Draxler mentioned his satisfying performance when winning the 2017 Confederations Cup in Russia with Germany this summer. 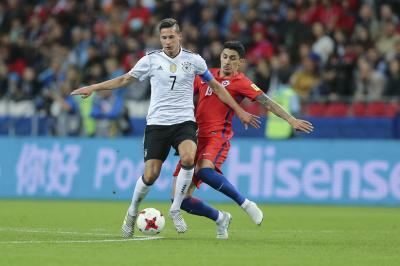 “Playing the Confed Cup and now the European qualifiers with Germany proved I am at a good level to deliver good games over a longer period,” Draxler stressed. For German national coach, Draxler is one of his cornerstones when it comes to defending the World Cup title. Loew called Draxler “one of our best”.